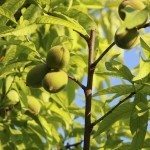 Regarding fertilizer for peach trees, I have a second year semi-dwarf peach tree. What should I use for fertilizer? How about steer manure, or fireplace ash? When I planted this tree, I mixed a lot of dead leaves in with the soil. Steer manure is good, but I would make sure to balance the high nitrogen in it with a phosphorus amendment. Otherwise you could end up with fewer flowers/fruit. Wood ash is good as well, but scatter it lightly, as in concentrated quantities, it can hurt the plant.